Despite The Croods becoming a huge hit in early 2013, Dreamworks' previous effort Turbo became one of their least profitable films of recent memory, which was even more of a blow so soon after their 2012 bomb Rise of the Guardians. It's time yet again to see if they can get back on their feet; with their new animated film adaption of the 1960s cartoon Peabody's Improbable History. Despite being the world's smartest dog, Mr. Peabody (Ty Burrell) faces a greater challenge with fatherhood, particularly when he risks losing his adopted son Sherman (Max Charles) after a fight with a school bully. 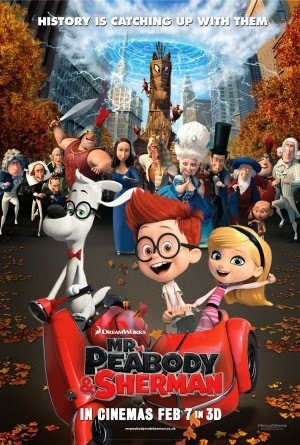 Peabody's attempts to spark a friendship between Sherman and his bully Penny (Ariel Winter) lead her to discover their secret WABAC time machine, resulting in Penny being whisked away to Ancient Egypt. In their attempt to rescue her, Peabody and Sherman begin to face greater troubles as they inadvertently damage the space time continuum, leading to a literal race against time to restore a number of broken timelines and save the universe. 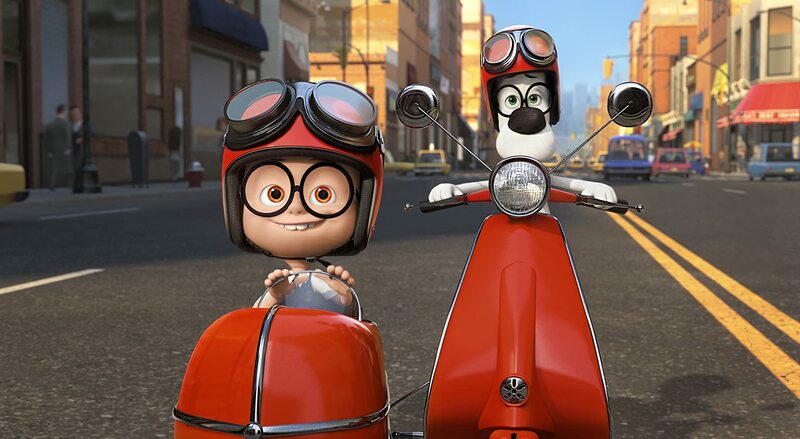 A zany time travel plot and gorgeous visuals make Peabody & Sherman a thoroughly appealing fare for children, but it boasts enough wit and charm to provide a similar appeal to adult audiences. Intertwined with the time travel antics is a satisfying father-son storyline, with some really strong moments beautifully performed by Burrel and Charles respectively. The relationship between Sherman and Penny is perhaps a little too unbalanced, and it's difficult to fully connect with it when Penny herself is an extremely unlikeable character. The stronger focus on Peabody being a father instead of Sherman being his 'pet boy' isn't 100% faithful to the original cartoons, but to say it's inferior would be a lie without a doubt. When it comes to this side of the plot, everything is handled carefully and wonderfully - the balance of genuine emotion and comedy is relatively flawless. Sadly the slipup comes with the time travel aspect, which lacks focus and a solid pace. This is particularly evident in the film's climax, which is far too sudden, contrived and a little random to make for a satisfying ending to the previously established tension. Mr. Peabody & Sherman is heartwarming and aesthetically flawless. It's also built round a solid script with witty dialogue and some excellently timed jokes - it's a shame some parts of the story feel a little underwhelming. There's two main elements to this story; Peabody and Sherman's relationship and the journey through time. The former is handled excellently, but the latter could've been better.